Becoming a Better Help Meet: What does that mean? To kick off this series…let’s talk about why in the world we need to be a help meet. And…what is a help meet anyway? I know for sure that I don’t have all the answers to these questions. The mystery of “what is a help meet?” can seem deep, heavy and complicated. After much prayer, I found it very helpful and refreshing to just cut out all of the difficult and specific questions in my mind about being a perfect help meet and just look at the simple basics. Read chapter two of Genesis. God had created the earth and everything in the earth. He made this man named Adam…and he put Adam in a beautiful garden. So…God brought the entire zoo of animals and birds and fish before Adam. Adam had a nice time naming them all. ( “You are a goat”… “You are a zebra”… “You are a gnu with a silent “g” just for the fun of it and because I said so.”) But after a while, the chickens were just not cutting it. Adam needed encouragement, he needed someone to help him remember where he put his hatchet, and he was lonely. Adam needed a helper. So, God put Adam to sleep, took out a rib, and made a lovely person similar to Adam…yet oh so different in many ways. Now God, of course, does not make any mistakes. He knew exactly what he was doing when he made the lovely woman to be the man’s helper. He knew what he was doing when he made the man and the woman alike…and yet so different. He created the perfect combination. He made husband…and wife. God made BOTH man and woman in His image. And He made the woman to help the man. Well, I for one feel highly honored. God made me, Laura, to be a helper for Matt. That makes me smile. This guy I love like crazy and think is really, really neat? He loves me and asked me to marry him and I get to be the one to help him in this life. Is that not one of the biggest honors God could have given me? Ladies, I do believe we have been given the best job in the world! Share with us: What are some of the basic, everyday things you do for your husband that make his life and his work easier? I know for sure that you do A LOT to help your husbands everyday, so I can’t wait to be encouraged by your comments!! I bet you’ll be encouraged too when you think about all the ways you are a great helper to your husband! Challenge yourself: Are there ways you can improve as a helper? What small (or big) things can you do that will help your husband get through each day? – Don’t beat yourself up about it…just challenge yourself and pray about ways you can be a better helper. Yay! God chose YOU to be the best helper for YOUR husband! You make his life better, richer, more fulfilled and more full of joy! As you go about your work today, do it with peace, knowing that you are doing just what God called you to do! The most simple thing I do for my husband is to make sure the alarm is set for him to wake up for work. I stay home, so this is sort of my part of showing him I support him. It also reminds me that I DON’T have to wake up to an alarm (anymore) and I’m thankful to the Lord and my husband for that – and I’m sure my son is thankful too. The one thing I try to do every day for him, is make sure he has a lunch to take with him to work. It’s a two fold blessing, really…he gets a lunch to eat while working hard and we save money when we don’t choose to eat out!! Win-Win!! I also and working on being more peaceful as a mom and wife. That is one area that I need to give to the Lord daily…moment by moment. He is faithful and I know I will have victory one day. I have my good days where the kids are peaceful because mom is peaceful…but, let me be honest, there are plenty of those days where I am not peaceful…and well, you guessed it. Neither are the kids. I know that is one thing that would please my husband is for me to seek peace and pursue it!! Thanks for such a great post, Laura. May the Lord bless you in your endeavors to please your Maker as your housband’s help meet. I also am working on being more peaceful as a mom and wife. That is one area that I need to give to the Lord daily…moment by moment. He is faithful and I know I will have victory one day. I have my good days where the kids are peaceful because mom is peaceful…but, let me be honest, there are plenty of those days where I am not peaceful…and well, you guessed it. Neither are the kids. I know that is one thing that would please my husband is for me to seek peace and pursue it!! Thanks for such a great post, Laura. May the Lord bless you in your endeavors to please your Maker as your husband’s help meet. My mother-in-law will unplug all the phones in the house when she and her husband have dinner/quality time together to make sure it is not interrupted! I am working on “helping” my husband by NOT trying to be helpful by making comments (directions, suggestions) when he is driving. I have an amazing husband who helps me way more than I feel I am helping him. I have recently gone back to work (teacher) and he fully supports me and has taken on a lot of the chores at home. He is a minister and therefore has a flexible schedule and rewarding job, but no health insurance. I am helping the family by providing health insurance. I do as much as I can around the house and make sure we have clean laundry and a menu plan for the week. My challenge is to be more content with the present. I tend to look toward the future and what we could accomplish, instead of doing what could be done today to make things great for today. I help my husband by making tea for him. He loves unsweetened tea. I can’t stand tea in any form. But he’s very busy and making a gallon of tea would take time away from the things he needs to get done. It’s just one small way I can show my love for him. My challenge is to keep our home neat and tidy. Hubby is an orderly guy. He often gets teased by our friends and acquaintances about being OCD, though he isn’t. I’m messy. It doesn’t bother me. But it does bother him. I want to honor him by having an orderly house. Making healthy food, doing the laundry (and putting it away-always a challenge! ), and watching our 4 boys every day are the basic things I do for my honey. Something that the Lord is working on in me is giving my husband space. He is a quiet man and needs time to think and process things and I can be a tad eager to talk to an adult after spending the whole day with 4 littles. God is showing me that He can work in my husband’s life better when I give him the quiet that he needs. Practically speaking it means not always talking when we’re in the car together…or not always expecting him to hang out with me after the kids are in bed. It is a good thing to learn and I’m learning to rely on God to fill me up more too. I rise earlier than my hubby each morning, I have his coffee ready, and a warm breakfast for him to eat. Sometimes I’ll have a lunch packed or not. My hubby sometimes likes go out w/his buddy’s at work. I then make sure I pray for my hubby before he leaves, as he does the same for me. My hubby helps around the house, as we both work outside the home. I never felt a calling to be at home. (besides our children are school age and go to a private school) And I love my job! He doesn’t require or even want alone or want quiet time, we both love spending time w/our kids, and once they go to bed it’s OUR time. I also try and not over schedule our weekends, so we can have more family time. For instance this past weekend we were pretty busy. Now next weekend it won’t be, nothing is planned. Also, sometimes the ladies in his office will sometimes order out, so I make sure he has money in his wallet. Those paralegals! lol. My hubby does have to work on cases, if he’s in court that week or whatever. but he tends to do that after I’m in bed, unless it’s a big case. nice job danielle!!! You are already doing every day what is my challenge- rising earlier than my husband. Way to go!!!! Thanks Jennifer! it’s really easy for me, I’m a morning person. Even on the days, my hubby tells me I can sleep in. I really can’t. I forgot to mention my challenge! I want to encourage my hubby more to follow his dream of becoming a judge. He’s talked about it since we met, but really has dragged his feet about stepping out and running for judge. I do my very best to say positive things about him to the kids. For example, “Your Daddy is smart. He can help you figure this out.” Or, “Isn’t it nice that your Daddy works so hard so Mommy can stay home with you?” Or, “Don’t you have a great Daddy?” I want them to appreciate their Daddy even though he is not around as much as we would like him to be! Wow, what a wonderful and challenging reminder. My husband and I tend to parent and spend our free time very differently, and sometimes I notice my oldest doesn’t appreciate the difference. I need to make sure I’m more deliberate in praising all his merits (cause he’s got plently). If you both are on different pages parenting wise, is that not difficult to discipline? Can you both reach a compromise? It would seem it would cause more stife, and discontent, and if you don’t agree, that can cause problems in different places. I am so excited for this series. 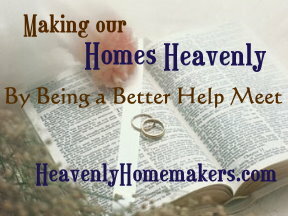 I am always looking for ways that God wants me to be a better helpmeet to my husband. I pray for my husband EVERY day either with him or in my devotional time. I try to never nag. I try to have dinner ready when he comes home. I often ask if there is anything I can do for him. When he’s working around the house I ask if he needs anything like water or snacks. I always thank him when he does things for me or our son. I am so inspired by all your wonderful comments!!! I am glad I found this blog. It has helped me be a better wife to my husband. I am work in progress. I Thank God For My husband who works so hard so I can be a stay at home mom. I am going to thank him tonight. My husband likes to put away his own laundry, but I break it down for him – ss shirts, ls shirts, work shirts, white socks, dark socks, etc. He just picks up a neatly folded stack and puts it away, quickly and his way. He doesn’t want me to take out the trash, but the children collect it all and I tie up a big bag and put it by the back door for him. If he’s working in the office, I call and invite him to have lunch with us. It makes him feel special and we get that extra time with him. If he can’t come home, we pack a lunch, include some love notes and treats, and deliver it to him. In general, trying to teach the children to pay attention to Daddy’s needs – what can we do to make things easier for him – hang up his coat when he gets home, clear his dinner plate, give him a foot massage! I work diligently to have my home clean so my husband can feel a sense of calm and relaxation when he is in his home. I try to be attentive to his needs, physical or otherwise. I try to be aware of when he needs some time to do “guy stuff”… and then not complain about it. I tell him, often, how much he is apprciated. Every one needs to hear that… and it is such a simple act that goes such a long way. I always make sure his alarm is set for the morning, pack his lunch for work, and make him coffee in the morning. I also always hang his lunch bag on the door in the morning so he won’t forget it when he leaves for work. I work hard to always have a hot tasty meal ready when he gets home from work. I just LOVE it when he walks in the door with a big grin and says, “mmmm…the house smells so good, honey. I am so glad to be home!” As for the challenge…I have many things to work on – mainly I’ve been learning to not bombard him with questions or hurry him to the dinner table when he walks in the door from work. I need to let him relax a bit first. I am working on making sure “home” is a nice place to come to after a long day at work. I try to be a helper to my husband by keeping the house clean and having the girls engaged in some (neat & quiet) activity when he gets home. I try to have supper going when he gets home and try not to unload my day’s problems on him when he walks in the door. I do most of the child care during church services so he can listen to the sermon without being distracted. I try to stick to the budget when shopping but I need to do better in this area. I also have felt convicted to wake up when he does (although it is early and I am not a morning person) just to help see him out the door and make sure he remembers his lunch. I pray for him constantly because I know he has a huge weight on his shoulders to be a Godly husband and father. I also need to spend less time on the computer at night and more time with him after the kids go to sleep. Thanks Laura for this series. The world bombards us with messages that men stink, housework is beneath a woman, and that we should take care of ourselves first. After years of buying into that, I need the encouragment and to be reminded that my job as his helper was created by God himself. I set up his lunch for him and get the coffeepot ready so that he can just grab everything and go in the morning. I also try to have dinner ready when he gets home because he is always starving by then. I wish I wasn’t so picky when he tries to help me. I like the laundry folded my way and the dishes put in a certain spot. I wish I could just let him help me and appreciate that he is willing to do so. I love this series and hope to learn so much from it. Thanks!! I have to be honest here. I am a complainer and a nag, and I suffer from the “grass must be greener” syndrome often. Bottom line? I have a long way to go. God is helping me to realize my own value as a working mom who provides health insurance and a steady check to add to the busy yet unpredictable work schedule of my husband’s. I try to clean the house and do laundry and tidy up on nights & weekends, but I am the best helpmeet to my husband when I slow down, take it all in stride, and realize how blessed we are to have a happy healthy son, even if I can’t stay home with him all week. I pray for wisdom & patience, to understand my true role in MY family & how best to show my husband how much I love him and our life together. Thanks Laura for this series, and this blog. You are a great tour guide for those of us watching from the outside, wanting to let God in, but having trouble getting the invitation right. That’s the great thing about a relationship with Jesus…we don’t have to get the invite correct we just have to accept His invitation! Nikki, I have a long way to go too. I’m just selfish with my time; I want to do what I want to do rather than clean the house. We can do it! So, I am probably the 15th person to say that I pack my husbands lunch as part of how I help him :) He does appreciate it a lot when he doesn’t have to eat hospital food! I also REALLY try to make sure that he gets time to himself. He is always refreshed when he comes back from some “free time” where he goes to Starbucks with a friend (or alone) or sees a movie. With four kiddos it’s not very often but he is very grateful when I tell him he has a “kitchen pass”. The biggest challenge that I have is remembering to give physical affection. With four small children I feel like someone is touching me ALL. DAY. LONG! So, sometimes I forget that my husband REALLY needs me to hug him and give him physical attention. Just rubbing his back after work or holding his hand while he talks to me about his night speak volumes to him about how much I love him. My husband is a full-time student and works full time also, so he has a very busy life right now. I make sure he has a hot breakfast every day and lunch ready to go (it’s a theme here with all of us!). I don’t work as early as he does, but he appreciates me getting up with him anyway, and I love spending early morning time with him. It’s also special for me to know how much it means to him that I’m up with him like that. What I’d love to improve on is being more consistent with having the clutter and laundry and dishes cleaned up before he gets home. The visual impact of the clutter makes it somehow less peaceful when he gets home, and I let that get out of hand more than I’d like. Plus, having things neat makes it more peaceful for me, too. I do dozens of things, from packing his lunches to making our laundry detergent to save money on the household budget. One thing I do every day is listen to him. Just listen to him talk about work. It’s very boring to me but he likes to tell me about it so I’m learning to be interested. But the biggest thing I did recently was give up my shopping spree. Husband promised me money from our tax return to buy new clothes (I need them really badly too) and after giving it some thought and discussing our budget for 2010 I told him he could have my money to pay off our last credit card. Then in a couple months I will get a little money to buy some clothes, but not the $500 I had been promised. But it’s worth it! Each day I make pack a lunch with enough snacks and lunch for the day. I also put a little note in his lunch just to encourage or let him know how much I appreciate him. My husband just started a new job that requires him to leave the house at 5:30am and not return home until 5:30pm. Like many of you, I pack his lunch and breakfast for the day, and have his coffee ready to start in the morning. Most days, I make every effort to wake up and see him off to work. I have found that this is the best way to get my peace and quiet time in before my boys wake up. As for my challenge – – encouraging him when he still needs to spend time studying after a long day at work. OK, I guess I will be the first go comment on the intimacy portion of being a help-meet. After being on the go all day with four kids, a house, cooking, volunteering and everything else that happens in a day, two things tend to suffer a bit. One is keeping my house clean, the other is being truly passionate about our “alone” time. By the time kids are in bed and asleep, so am I, despite really wanting to be there for my husband. Then at 5 in the morning when I am awake, he is asleep. As his wife, I decided to finally talk to him about what we could do. Turns out, he would be thrilled to wake up at 5 if that meant having a chance to start his day with a wife who was feeling amorous and not just like she was fulfilling her wifely duties. This is a very important aspect to a healthy marriage that was solved simply by talking about it. I, like a lot of the women who posted, make sure my hubs gets lunch and I make him breakfast before he leaves. I have to get up pretty early to get this done but it has been so nice seeing him off every morning. I think, to him, this is the most important part of the day, food drives him!LOL He is fine when I don’t get up for what ever reason but LOVES when I do. I have not had hard feelings towards him for having to get up because he has never asked me to, it has been something I have wanted to do. Also, he hates scrambled eggs, so when he’s home even when the rest of the family is having eggs scrambled, he gets his over medium. Making the coffee the night before so its ready for him when he gets up at 5am when he’s home is always appreciated by him too. Laura- THANK YOU for a great start to this series! Wow!!! I am encouraged by all of you amazing helpmeets! You are all doing such a great job! You will receive blessings in heaven for your daily efforts…. What an awesome series. As women in this age we are constantly bombarded w/the attitude that serving your husband is demeaning. As Christian women I am so glad that we have an example in Christ Jesus, who came to earth to minister to our needs. What a blessing to be able to follow him as women serving our husbands and families. Now to the question! My husband is deployed, yet again. So the most important things I do for him revolve around keeping home steady and stable since he’s often away. I work hard to be a good steward of the resources the Lord gives us through my husband’s income and my part time job. I, through God’s grace, try to train our son in the nuture and admonition of the Lord. I make an effort, harder sometimes than others, to encourage him while he’s away from us, taking care of as many problems as I can on my own. That’s a struggle for me. I would rather he make the decision. And I pray for him daily. My husband is not a Christian so this heavy on my heart as well. What I need to work on. Giving him space when he is home. Oh to be able to wake earlier than him to have coffee! Allowing him to complete his tasks at home in his own time. With the constant potential for him to be called away, I tend to try and schedule the things I want him to get done, now. thanks again Laura, for this opportunity to share. Wow….you ladies are awesome. Honestly I don’t feel like I do anything truly special. I, unfortunately don’t pack his lunch on a consistant basis. I try and get breakfast ready for him, but I sometimes don’t have it ready by the time he needs to leave. So, I guess those would be my challenges. A couple things I do for him is cut his hair which is a dual purpose as he needs his hair cut every 2-3 weeks is could get quite expensive so it saves some $$$. I also rub his feet for him. I found a nice smelling “guy-lotion” while on vacation a few years back in TX and have been using that. I no longer work outside the house so I am spending time learning more about healthier, greener life for us and trying to transition to that while trying to do it on a budget…I know he loves it when I save $$$$! My husband has just begun working from home (again). I learned the hard way from before that I have to protect his work time and minimize/eliminate interruptions from myself and the kids. I am a person who likes to have everything my way, and I’ve had to learn to show respect to him by not always telling him how I think things should be done or telling him how it would have been better if… Again, a lesson learned from doing it wrong a lot! I have learned also how much he needs my affirmation and my critical comments are incredibly hurtful. I’m thankful that God teaches me, often through my mistakes! I prepare his lunch and always send him a treat like potatoe chips. This year I determine myself to improve my cooking skills and learn new plates and he is enjoying it since he love to eat good food. I suport him with his career goals and plans….I even moved to the US this year because he’s applying to start his PhD. And I’m learning to be comtent whatever circumstance I’m living.